A Shoshone Indian, Sacagawea was the only woman to accompany the 1802-6 Lewis and Clark expedition into the Louisiana Purchase territory. 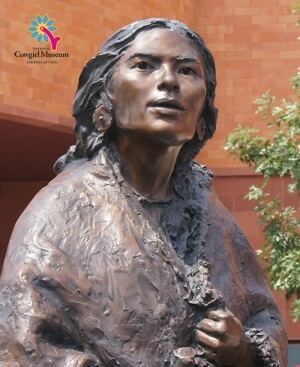 Brought along by Toussaint Charbonneau, the official expedition guide who purchased her from the Hidatsa Indians, Sacagawea acted as interpreter and guide. Her assistance became vital as she persuaded the Shoshone to supply horses and guides to the expedition to reach the Pacific. Her presence also allowed the company to pass safely through an area known for inter-tribal warfare.